We’re located at 1281 West Riverside Drive, Perth-Andover, NB. Stop in to experience the relaxed atmosphere, touch hundreds of beautiful fibres, and even learn a new craft. What’s your preference? Whatever it is, chances are, we’ve got it covered! Wool, alpaca, cotton, hemp, linen…in everything from the purest naturals to exquisite hand-dyed skeins. Weavers love our looms, cone yarns, heddles, and other notions! 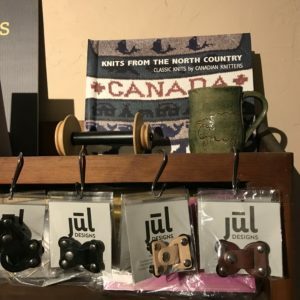 From clasps and closures, shawl sticks to coffee mugs – you’ll find the most amazing gifts for your friends and family right here in our shop! Located in a historic heritage home (1856) in Perth-Andover, NB, the gallery has been home to many artists, most notably Violet Gillet. Vi was an author, painter, ceramics & fibre artist, and also etched glass and many other artistic pursuits. The gallery is named for one of her books, Where Wildflowers Grow. The gallery is a destination for fibre artists to gather their supplies, tools and inspiration. 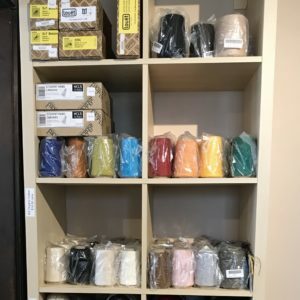 Our inventory includes many natural yarns and fibres, such as hemp, organic cotton, linen, wool, alpaca, silk, and more. We also have weaving, spinning, and tatting supplies, as well as items made by local artisans. Great little shoppe! I was in for the first time today and was pleasantly surprised with the selection and prices :) Great customer service...will certainly be back! Great shop carrying an array of fibre crafts. I will be back for many visits! Prices are on point too! I stopped in there today, I will be back. The customer service was top knotch and she knows her stuff. Absolutely an amazing store and so luckey to have it here in Andover. Thanks for a lovely visit and the great yarn and needles, well worth the trip to see you. An awesome shop... Lynn Piercey has made a terrific addition to our village with this fibre craft centre...I bet you can't visit & not be inspired to try fibre crafts yourself...if you are not already 'hooked'! Great mixture of real quality yarns in both vibrant and natural colors. Something to please everyone. 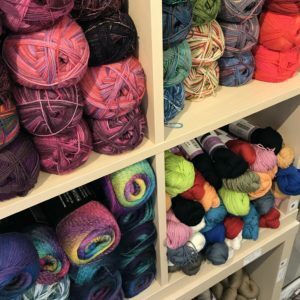 Really nice variety of non-wool yarn. You've gotta stop by.